BRIGHTON, Mich - Late last week, Ford's Kansas City Assembly Plant Welcomed 1,000 New Employees. These new members of the Ford family are assisting in the production for the launch of the all-new 2015 Ford Transit. The vehicle is set to go on sale in the United States this summer. 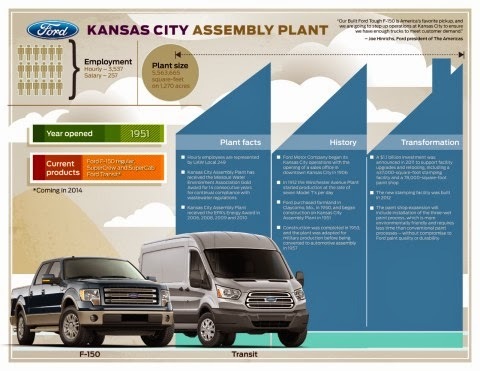 Ford Motor Company announced that 1,000 new employees will be working at the Kansas City Assembly Plant to begin production of the all-new 2015 Transit. It was also announced that 175 additional workers will be hired by March to help with production as well. The Transit is one of 16 vehicles -23 globally- to be launched in the United States this year. The Transit has more than 45 years of heritage in Europe, where it is considered to be the best-selling medium commercial vehicle nameplate. The all-new Transit, going on sale this summer, will offer a wider variety of roof heights, wheelbases and body lengths, and a full suite of onboard features and technologies that are designed with businesses in mind. The all-new Transit will eventually be replacing the E-Series, which has been America's best-selling van for the last 35 years. First sold in 1965, the Ford Transit is the best-selling commercial vehicle in the UK for 48 years. More than 7 million Transit vans have been sold globally and each one offers the driver power, durability, and capability to get the job done well. The all-new Transit is offering customers cargo volume up to almost 500 cubic feet, will achieve roughly 25 percent better fuel economy, and haul at least 300 pounds more than today's E-Series. As Ford's Kansas City Assembly Plant Welcomed 1,000 New Employees, the company hits the mark of creating more than 5,000 new jobs in the US, including 3,300 salaried positions. More than 14,000 jobs have been created by Ford in North America throughout the past two years. Brighton Ford carries the very latest and greatest Ford vehicles. We offer a variety of new, used, and pre-owned vehicles to those in Dearborn and the surrounding areas. If you are looking an awesome deal on a Low Mileage Used Car or Low Mileage Used Truck, Brighton Ford is the place for you! Stop by the dealership today and go for a test-drive today!